I was going to watch Uphaar, but that wasn’t available anywhere. So then I was going to watch Guddi, but I couldn’t find my DVD. And so, with every other door closed to me, I was forced to turn to Mili. The film I bought 4 years ago and have been avoiding in fear of the sad bits. And because he made different movies, he had a different kind of cast. This film is an interesting combination. Aruna Irani, a character actress and item dancer. Jaya Bhadhuri, IIT graduate in acting and India’s sweetheart. Ashok Kumar, Hindi film’s first true Star turned character actor in old age. And of course Amitabh Bachchan, charismatic poet’s son with the deep voice and rich delivery and the sudden massive success just as this film was releasing. Along with the usual gathering of Mukherjee character actors. This entry was posted in Uncategorized and tagged Amitabh Bachchan, Ashok Kumor, Friday Classics, Jaya Bachchan, Mili by mredlich21. Bookmark the permalink. I’ve liked every Mukherjee movie I’ve watched…he really had a knack to combine the Kolkata way of filmmaking with the Mumbai/Bombay way. And like you wrote: he made the actors appear to be ‘real’ persons (I more than once wondered what he would have made of ShahRukh’s acting skills). 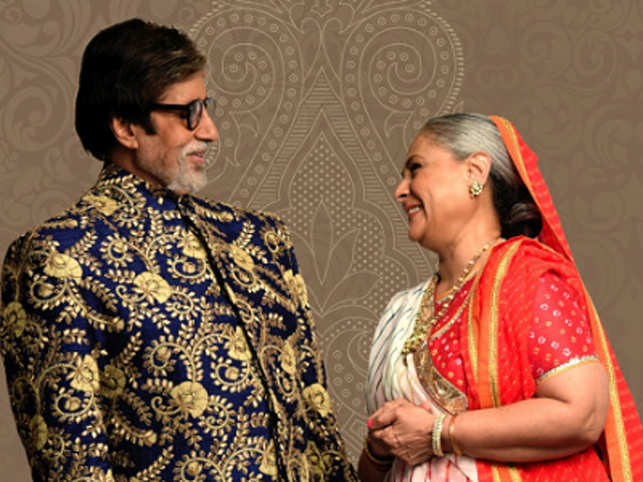 There arent that many receny photos of Amitabh and Jaya just themselves without family, but the ones there are are really good. More importantly, what he would have made SRK act like! Can you imagine the possibility?! The 65th National awards were announced today. Did you check it out? I just saw a little coverage just now. Crazy day at work (new employee starting, she is desi, I am dreading the reveal of my obsession) so I haven’t had a chance to really look at it. Thanks for at least trying to find Uphaar. Maybe this explains there is so little written about it compared to Guddi. Actually when you do track it down, you should watch it and then watch a Satyajit Ray film called Teen Kanya (three stories about girls), where one of the stories is based on the same source material, and compare the two different takes. I think Rajshri might have the rights, I saw a bunch of Uphaar songs on their youtube channel. So maybe they pulled it off the internet because they are planning to do a fancy re-issue of some kind? Or at least we can hope. Meanwhile, the whole Mukherjee collection landed with Shemaroo and they have been cranking out DVDs for years, so maybe that does explain why Guddi has a higher profile. Wait — I seem to remember now that Rajshri actually produced Uphaar. It fits in perfectly with the type of “family” movies they like to make. And it also explains why it’s not been pushed since, because again that’s the Rajshri style not to overhype their films, or at least not to market them after their initial release. Some years ago, the India Film Festival of Los Angeles was doing a retrospective/tribute to Madhuri Dixit (when she was still living in the U.S.), and they didn’t have HAHK on their list of films! I wrote to them asking why, and listing all the reasons why it had to be included in a list of her iconic films. They actually replied to me, saying that they had tried, but had a hard time getting a hold of a subtitled print that met their technical specifications, or some such, and that Rajshri was no help. Heck, there was some film festival in New York that was doing a tribute to Amitabh, for which Jaya was actually curating his films, and they couldn’t get a hold of Sholay! Strange are the ways of Indian film rights, I guess. One of the reasons I love Rajshri is because they have chosen to put so much of their content up on youtube. Which is kind of them, but also smart, I am sure they can make a bigger profit from youtube ads then from all the expense of printing up DVDs and shipping them and so on. Especially when people are so much more likely to just choose a pirated free streaming version anyway. So, why not Uphaar? Maybe it’s like MPK and HAHK, they actually have a pay streaming deal with some company for it? But MPK and HAHK, as well as HSSH are all on youtube, as well as their Telugu dubbed versions on the Telugu Rajshri channel. Anyway, I just checked, Uphaar is also on youtube (not on the Rajshri channel, though), but without subtitles. Rajshri has a vast collection of all their films, whether produced or distributed by them, in all languages, on their various Youtube channels. The only thing is they don’t have subtitles. Rajasri people are very generous like their films, and very human in their approach. never show violence, or show alcohol or Meat eating scenes, or women degrading parts. One of the reasons I love Hrishikesh Mukherjee’s films are they are so reminiscent of Malayalam films.Much as I love the drama and twists of a typical Hindi film, I love the dose of realism he adds to even conventional Bollywood plots, as you say.Twins,switching identities,betrayal of friendship.I don’t remember crying over Mili.Thank God they didn’t opt for melodrama.It’s a triumph of the spirit.And Mili would want it that way, if she knew that a film was being made on her life. Yes! What I love is that it isn’t just a triumph of Mili’s spirit, but everyone around her. Amitabh and Ashok and Aruna Irani all choosing to find greater strength and beauty instead of giving in to dispair. The lack of theatrics in HM films is such a refreshing alternative to both the edgy “real India” art films and flashy, “so removed from reality it’s a culture of its own” mainstream films. And it came at the same time as the slide of life cartoon strips from Pran, etc. The mid-70s were really when the hindi speaking middle class stabilised and discovered a culture of their own. They’re about the “normal” people. What would be the American and British cultural equivalent of this? Hmm. Interesting thought. I don’t know if you really can compare American and British films in this way. Post-war, there were a series of bitter films from both industries, “The Man in the Grey Flannel” suit type stuff that challenged the idealization of the middle-class. Followed by the 60s and 70s films during the break up the studio system that were about the counter-culture. More recently, when I think of British films that deal with people that feel less filmi and more real, I think of stuff based on race, like My Beautiful Laundrette. If I think about something that feels like a Mukherjee film, with that ultimately hopeful view of the world and of everyday lives, I would go back to something like It Happened One Night or Miracle of Morgan’s Creek in Hollywood films, or Four Weddings and a Funeral in British films. Another option might be the Norman Lear series of TV shows in America in the 1970s that dealt with working class people and working women and other issues that popular culture hadn’t shown before. Oh! That reminds me of another one! Ed Zwick’s TV shows, Thirtysomething and Once and Again. And the other ones he inspired, Brothers and Sisters and Parenthood and now This Is Us. They are upper middle class slice of life shows, similar to Mukherjee’s films. And I can relate to Thirtysomething because it is the kind of family I grew up in, and This Is Us because it is the kind of people I am now. Same families, just moving forward to the next generation. I LOVED brothers and sisters and sorta also love this is us. For some reason it felt a little slow to me.